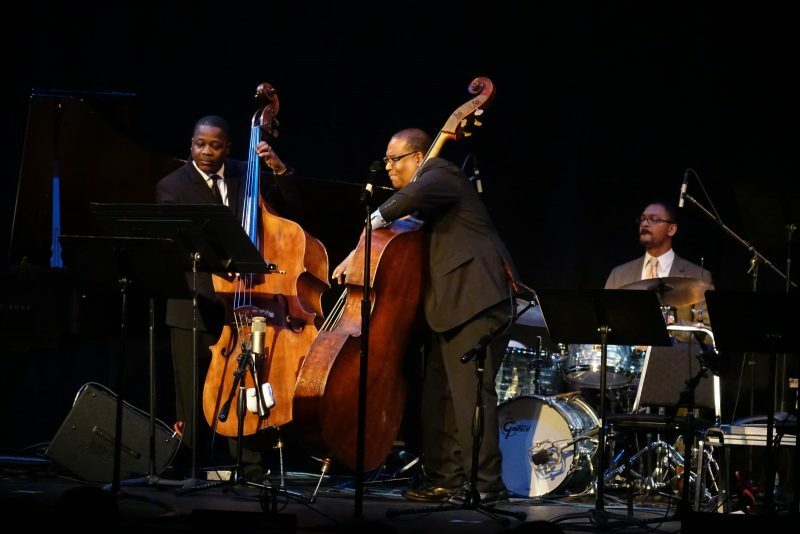 Jazz is always prominent when the Savannah Music Festival cranks up its eclectic assortment, with diehard jazz fans dropping anchor during Jazz Week, culminating in the epic Swing Central Finale concert at Lucas Theatre of the Arts. 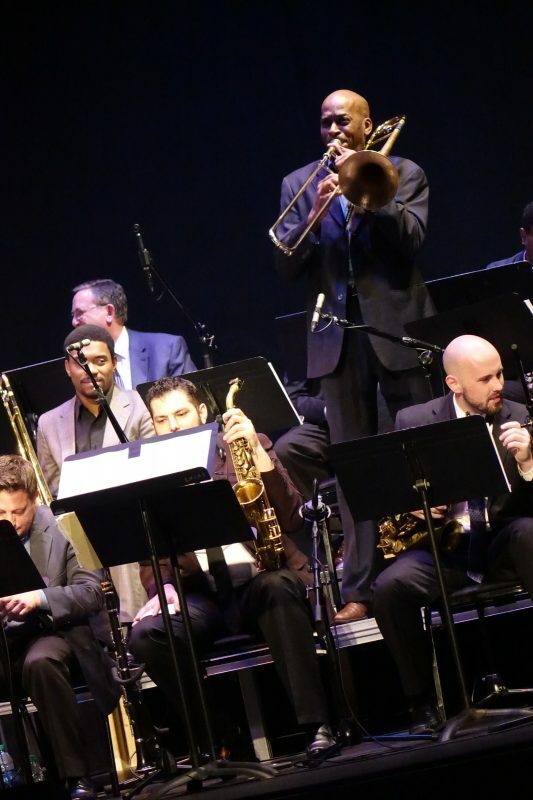 Three high-school big bands perform, finalists of the Swing Central workshops and competition, followed by a concert where the mentoring musicians strut their stuff. This year those mentors included Marcus Roberts, Ted Nash, Terell Stafford, Jason Marsalis and Marcus Printup. Celebrating the centenaries of both Thelonious Monk and Dizzy Gillespie, Swing Central 2017 was particularly splendid. The Charles H. Morris Center was the workhorse venue for jazz concerts. On successive nights, the festival treated us to pairings of organ and trumpet aces. Ike Stubblefield and Joey DeFrancesco presided over the rare sight of two vintage Hammond B-3 organs on the same stage. 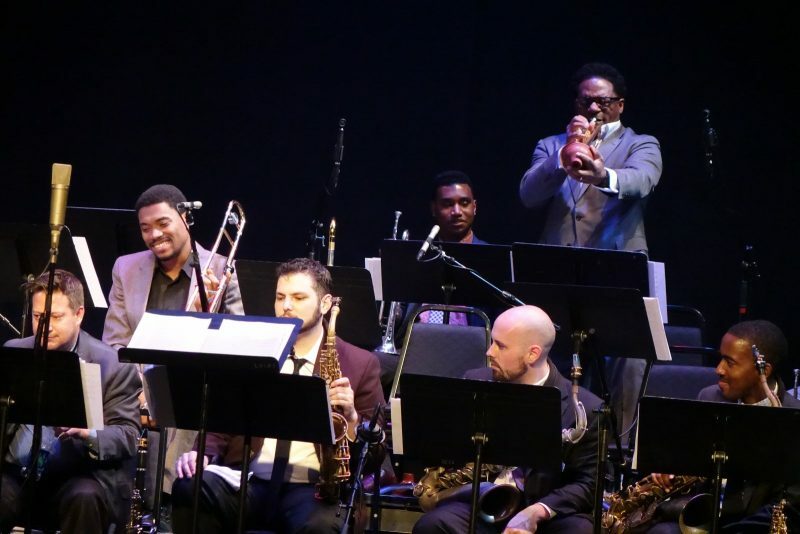 The next night, on the eve of the Swing Central Finale, Rodney Whitaker and MSU Professors of Jazz showcased the estimable Etienne Charles blowing his horn after Printup teamed up with a quintet of Youngbloods. Armed with a media pass, I was able to negotiate a 6 p.m. classical piano recital on organ night, step out for dinner, and arrive at the Morris Center just before intermission so I could ease into empty seats when Joey DeFrancisco & The People took over the stage. I first heard how DeFrancesco swings in live performance shortly after his first Columbia recording, at the tender age of 17 in 1989, so I thought I knew what to expect. But Joey now piles an electronic keyboard atop his B-3 console, and he carries a trumpet with him. Electronics bubbled up immediately in DeFrancesco’s percolating intro to “So Near, So Far,” nodding to both the straight-ahead and later electric periods of Miles Davis. That track remains fairly mellow on the new Project Freedom recording, but here Troy Roberts signaled on tenor sax that it was time to fasten our seatbelts as he finished playing the lead—DeFrancesco turning up the heat and Roberts keeping the flame high. Roberts is not your generic sideman, and both of his most recent recordings as a leader are well worth checking out. Dan Wilson was also a treat on guitar taking his choruses, never distorting his silky tone. Joey and The People then reverted to the trad grooves usually heard at the Morris. “Bluz ‘n’ 3” suggested the funky flavoring Cannonball Adderley brought to hard bop— until Wilson’s crystalline work conjured up Kenny Burrell. Roberts took us into turbulence with his solo, though there was a calm eye at its center. DeFrancesco seemed to relish the challenge of following in the wake of this bravura, prudently dialing back the intensity as he began. Reaching what seemed to be full throttle, Joey snuck in a sustained bass chord to play over, taking his two-fisted attack to an even greater sizzle. Jason Brown quieted things down at the start of his drum solo, ably shuttling from sticks to brushes amid the ebb and flow. Compared to this eruption, the next two selections were relatively light. “Better Than Yesterday” added a “Parisian Thoroughfare” élan to the Project Freedom version, with more rim work from Brown at the kit, more intense crosstalk between Joey and Troy and more quirky rhythms all around. Then a DeFrancesco spot like none I’d seen live before: he sang “Around the World” in a surprisingly effective hipster style and, after the choruses by Wilson and Roberts, returned with a trumpet solo, muted for the first half and then open. More outré still, Joey D scatted his final vocal, trading fours with Troy. Intro and outro on the righteous “Lift Every Voice and Sing” closely matched the studio recording, Wilson and Roberts splitting the opening chorus. But the sidemen added a little extra lift to the release into the solos and there was more real blowing in the middle. Enough funk was added to the live version of “Karma” for DeFrancesco to solicit audience hand claps behind his own solo and those by Wilson and Roberts. Instead of a predictable finale, DeFrancesco surprised us by calling Stubblefield back onstage to join in on the second B-3. 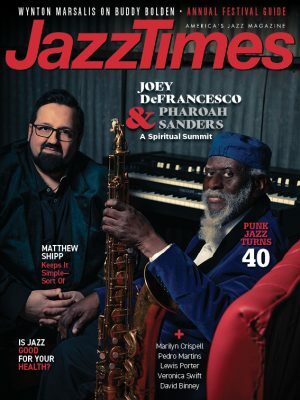 Two organ giants then paid tribute to a third as the ensemble dug into Jimmy Smith’s “The Sermon.” Things became joyous and jam-session loose when Stubblefield’s drummer, Herlin Riley, slid into Brown’s chair midway through the tune. Yet there was additional polish to the backup behind Ike, as Joey picked up his trumpet for a second time and formed a horn section with Roberts, playing harmonized riffs. In his gig at the Morris the following afternoon, Stubblefield, equally comfortable in backup or take-charge modes, broke loose most memorably on Richard “Groove” Holmes’s “Groove’s Groove,” a tune very much in the vein of “The Sermon” with perhaps a little more hop in its step. Guitarist Detroit Brooks worked the tune from a relaxed groove into such a lather that, for the only time in the entire set, he felt compelled to stand up while he played. Stubblefield also stirred the line upwards from a simmer, until he was howling at the skies before an abrupt halt, giving way to Riley. Like Holmes and Jimmy Smith, Stubblefield has a winning way with pop tunes whose tempos might seem set in stone. Back in 2011 at Savannah, he put some extra jump in “Misty,” as Holmes was fond of doing, but this time he took on Little Willie John’s “Fever,” which has resisted loudness, speed and even instrumentation since Peggy Lee waxed her chart-topping cover in 1959. After the organist grooved on it, Detroit showed there’s plenty to be done with this line at a peppy pace. For the trumpet summit, Morris Center was packed with an influx of Swing Central high schoolers on the eve of finals. Serving two sextets crammed with instruments you actually find teens playing (no B-3’s here), the festival was definitely catering to its audience. Featuring arrangements with heads that always blended two or three horns, Marcus Printup & Youngbloods dished out music the young crowd could savor. “Peace in the Abstract” kicked off jubilantly—Printup roaring into his opening solo as if this were the first time he was playing the tune—this time featuring entirely different bandmates than on the 2006 CD with that title, and with no holdovers from Printup’s 2015 Young Bloods recording either. Young trombonist Corey Wilcox burned brightly in his follow-up, with alto saxophonist Mercedes Beckman dialing it back a little before rapidly ramping up. Pianist Michael King aimed unerringly for a change of pace, almost Monkish in his terseness. Henry Conerway III implacably picked up the intensity on drums underneath King’s action, along with bassist Eric Wheeler, and the pianist’s solo soon swelled to rhapsodic density. “Soul Vamp” was another trip back to 2006, but Printup gave the catchy tune a choppier, more energetic arrangement and added some vocal call-and-response to the out-chorus. With Printup’s own “The Bishop” and Dave Brubeck’s “In Your Own Sweet Way,” the leader finally plucked a couple of tracks from the Young Bloods disc. “The Bishop” showed off the whole group best, with Beckman blowing her finest solo and King unveiling a tasty Basie quality, again acting as a mellowing agent. Yet King was most distinctive, pointedly not Brubeck, in his freaky solo on the latter. “The New Boogaloo” became something of a family heirloom as Wilcox had one last chance to shine. Wilcox’s father, Wycliffe Gordon, was the trombone sideman on the 2002 CD named for this Printup composition. Hidden in plain view for the last two years among the Swing Central mentors, Wilcox announced he was a force to contend with at the 2016 late-night jam, dueling with his dad and other greats, and he reaffirmed it here. Printup and Beckham revisited the 2002 arrangement, soloing over a shuffle pattern laid down by Conerway until he provided a stop-time break for them to blow on. It was Wilcox—with King’s spikier accompaniment— who actually cooked up something new for “New Boogaloo.” After the horns, King took a modest but tasty solo, revving up his momentum with the first stop-time break and yielding gracefully on the second to Wheeler. The bassist grooved so compellingly that the audience joined in clapping out the beat. I loved how bassist Rodney Whitaker and his drummer, Dana Hall, casually took the stage for the MSU (Michigan State) Professors set, jamming quietly together as if they were doing a soundcheck. Before we knew it, trumpeter Charles and tenor saxophonist Diego Rivera were in place, looping into “In Walked Bud.” Twenty-four hours ahead of schedule, the Monk celebration had begun with an all-Thelonious song list. Unlike most of the Monk selections announced for the following evening, none of these were rarities. Randy Napoleon broke out on guitar with the first solo, pianist Bruce Barth demonstrated that “Bud” could turn in a barrelhouse direction, and Hall returned with a series of explosions from the drum set before the horns took the out-chorus. Charles was the most powerful of the frontliners, but he held fire until the ensuing “Monk’s Dream.” Rivera charged hard in his solo, yet Charles’ had more arc and build, ending with an elegant handover to Napoleon. Solos by Whitaker and Hall established a consistent mold, regularly marking each measure—until Hall broke that mold, mixing things up and splattering them like a textbook Max Roach fireworks display. You couldn’t ignore Charles on the final three tunes, each of his stints halved in a different fashion. Quieting things down after a Rivera roar on “Evidence,” Charles meandered softly for a while before abruptly turning up the burners. On “Ask Me Now,” he took two pieces of the opening chorus, one muted after Rivera kicked things off and another wide open after Barth handled the bridge. Not only did Charles play quite tenderly in his solo, but Rivera also proved to have an affecting soft side to complement his hard-charging mode, underscored later in a mellow coda. Both sides of Charles in the “Blue Monk” chaser were irresistibly ebullient. The trumpet master started off with a plunger, expostulating the line in tandem with Rivera. Napoleon delivered his most fiery work of the set, and Rivera reverted to his leonine mode before Charles cooled down, fanning the low flame with his mute. The plunger work became progressively louder and more playful until the time was ripe for Charles to discard the rubber and go all-exclamatory in Dizzy Gillespie style. The Monk-Diz centennial celebration lifted the evening even higher. Music directors Marcus Roberts and Ted Nash split emceeing chores while their set list took a singular approach to each of the honorees. Long acknowledged as a bandleader, showman and innovative instrumentalist, Gillespie hasn’t gotten nearly as much recognition as a composer. A greatest hits compendium can correct that oversight in a hurry. On the other hand, albums by younger artists devoted completely to Monk’s works are easy to find. It makes sense, then, to reprise Monk pieces we hear too rarely or to unearth new gems. While shuttling between familiar and unfamiliar tunes, the audience was zigzagged between big band charts and tight combo presentations, always with plenty of space for band members to blow. Signaling that this would all be fun, the band launched into Diz’s “Oop Bop Sh’ Bam,” a pretty grand display of the composer’s exuberance and the musicians’ firepower. 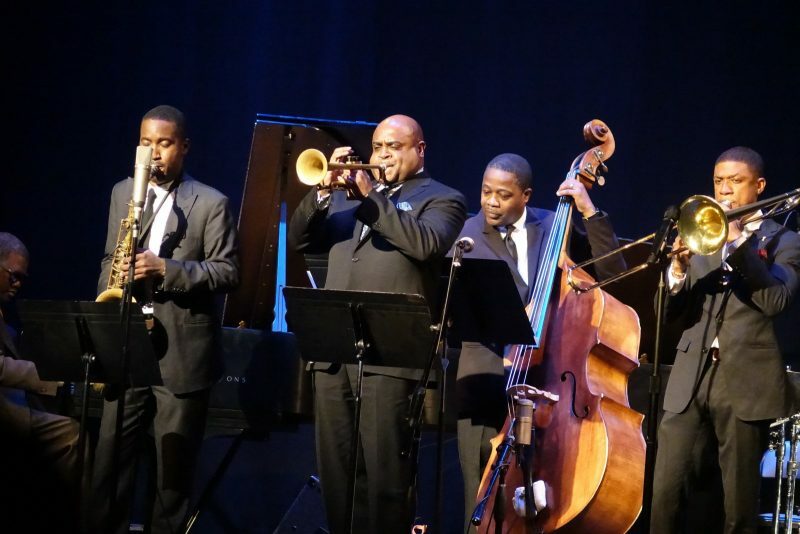 Initially, pianist Bill Peterson, bassist Whitaker and drummer Bryan Carter were the rhythm section. 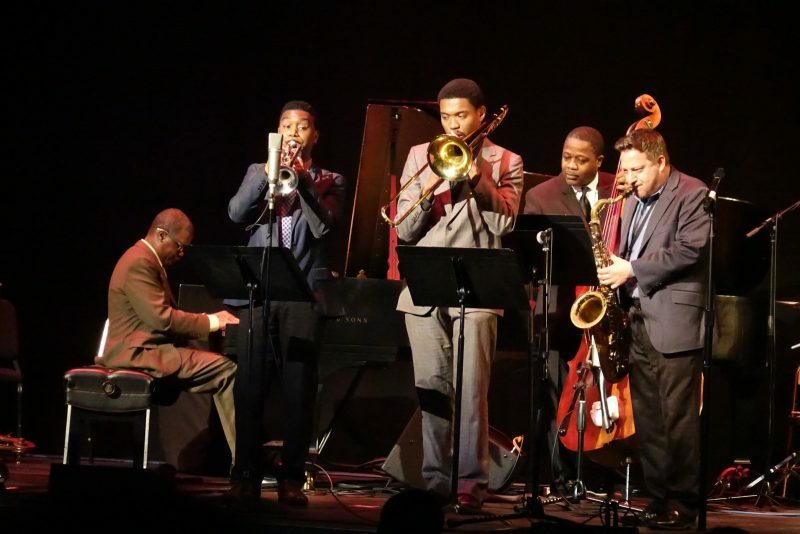 When the setting shifted to small combo mode for Gillespie’s “Groovin’ High,” the Marcus Roberts Trio took over the rhythm, Rodney Jordan on bass and Marsalis on drums, while David L. Harris on trombone, Ricardo Pascal on tenor and Terell Stafford on trumpet stepped forward to form an impromptu horn section. With the flare and assurance of his solo, Stafford gave us our first indication that he would be the designated torchbearer for Diz. Nash returned, alto in hand, with trumpeter Alphonso Horne and the Peterson rhythm for “Con Alma.” From this third iconic Gillespie title, the big band format returned as the Roberts Trio took its first turn with the full ensemble on “Blues Five Spot.” While it isn’t Monk’s most familiar work, “Five Spot” is obviously a Roberts fave, for he has now played it three years in a row in Savannah. The piece certainly distills Monk’s essence and lent itself to a nice round of blowing, with Roberts, Stafford and trombonist Ron Westray standing out. Both of the bassists played on Monk’s “Light Blue” and Marsalis was deployed to vibes for “Ugly Beauty,” a pretty ballad that served nicely to clear the way for a rousing finish. That one-two-three punch began with “Two Bass Hit,” Gillespie’s collaboration with John Lewis, with Printup and his plunger mute making a punchy cameo. Monk’s “We See,” and “A Night in Tunisia,” Diz’s most famous piece, closed things out. “Tunisia” was particularly potent on this night. One by one, the solos poured forth from the band members, an effervescent anthology of bebop. And after all the glorious blowing, after the whole band had repeated the anthemic theme, Stafford launched into a lonely cadenza, working it until he ended on a long, jubilant high note that could make a grown man weep. It was emblematic of all that jazz can say and do.